But here’s where things get interesting. We tend to assume political parties want to get their policy goals adopted, but also to stay in power. Republicans won control of Congress in 2010 in part because Democrats pushed through a health care bill that the plurality of voters did not approve of, according to several major polls from that time. 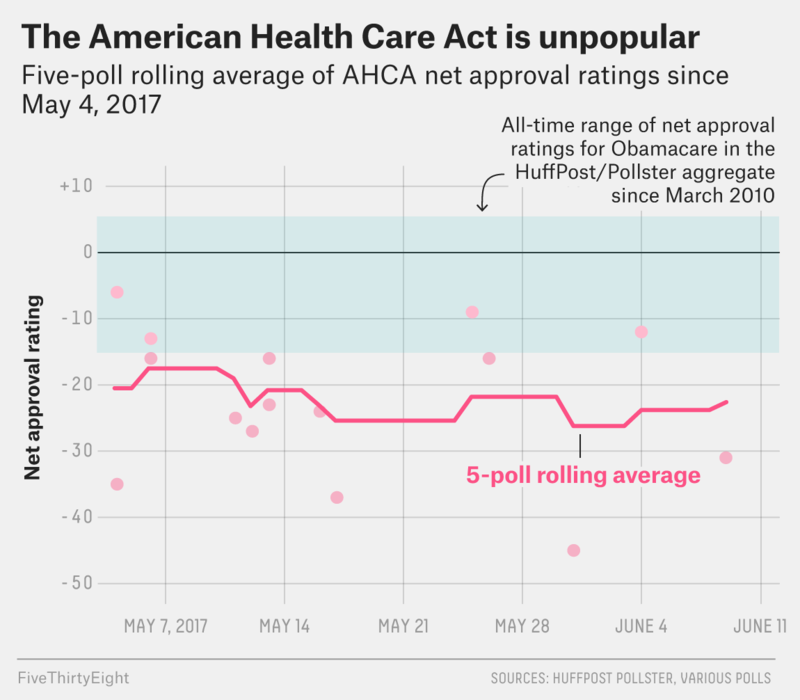 The Republicans are doing the same thing now, only their health care bill is significantly more unpopular than the ACA was in 2010. So why are Republicans so determined to pass a bill that they already seem to know is not popular and could hurt them in next year’s elections? It’s almost impossible to determine exactly what drives a politician’s actions, particularly because sometimes the reasons they give publicly are not their only or primary motives. So while we can’t prove anything, we can still identify four likely reasons that Republicans are pushing so hard on health care. There is a common view that politicians make promises, get elected and then don’t try to follow through. Wrong. Political science studies show that American presidents actually do try to implement most of the agenda they campaigned on. The academic research is not as conclusive about members of the Congress, but Politifact found that in 2010, House Republicans campaigned on a 21-page set of proposals and brought nearly all of those ideas up for votes. Throughout his campaign, Trump promised to repeal Obamacare, although he at times also made outlandish pledges about how he would replace it with a bill that offered coverage to all Americans, which the legislation emerging from the Republican Congress is unlikely to do. Much of the Republican Congress is also invested in repealing Obamacare. In January 2016, then-President Obama vetoed a bill to repeal Obamacare that was passed by the House and Senate, both of which were under GOP control, with nearly all of the party’s members in both chambers backing the legislation. Party officials promised after Obama’s veto that they would get an Obamacare repeal signed if a Republican was put in the Oval Office. “Republicans in Congress need to do what we told our constituents we would when they elected us: Repeal Obamacare and replace it with a plan that lowers premiums for everyday Americans,” Rep. Jim Jordan, an Ohio congressman and key figure in the House Freedom Caucus, said in a statement to FiveThirtyEight. One main school of political scientists defines a political party as consisting of three parts: the party’s voters, its elected officials, and the “party-as-organization,” meaning the groups that support and influence the party, including powerful labor unions on the Democratic side and groups like the National Rifle Association for the GOP. Polls suggest a majority of Republican voters support the health care repeal effort, but it is nowhere near universal. A recent Kaiser poll, for example, found that 67 percent of Republicans had a favorable view of the House version of the Obamacare repeal legislation, while 18 percent viewed the bill unfavorably and another 15 percent didn’t give an opinion. And crucially, a recent Survey Monkey poll conducted for FiveThirtyEight showed that while 89 percent of core Trump supporters like how the president is handling health care, only 58 percent of “reluctant Trump supporters1” feel the same way. These reluctant voters put Trump over the top in the Electoral College in 2016 and will play a major role in determining the GOP’s fortunes in 2018, and 40 percent of them disapprove of how Trump has handled health care. But even if GOP voters aren’t that jazzed about the push to repeal Obamacare, the party-as-organization groups, like the Club for Growth and Americans for Prosperity, are deeply invested in the effort. These groups provide volunteers and supporters for Republican causes and also spend tens of millions of dollars to either back GOP candidates or oppose Democratic ones in key races. It may actually make political sense to push a health care bill that is broadly unpopular with the public but keeps party volunteers knocking on doors and donors giving money. The current GOP rhetoric about Obamacare — that its markets in many states are collapsing and that therefore Republicans must enact a bill reforming the legislation and rescuing Americans who may be left without coverage — is misleading. While Trump and others in his party are eager to paint Obamacare as collapsing under its own weight, some insurance companies are publicly saying that one of main reasons they are abandoning the Obamacare marketplaces is that they are not sure that the Trump administration will take steps to support them. And the Republicans’ AHCA bill includes cuts to Medicaid, which has nothing to do with the Obamacare marketplaces. Many Republicans oppose Obamacare not because it is ineffective, but because it is effective in ways conservatives do not like. Enrollment in Medicaid has boomed under Obamacare. Many conservative activists and politicians say Medicaid should be be available only to the poorest Americans, not a program that covers more than 70 million people, as it does now. The Republican health care bill, in some ways, redistributes how health care dollars are spent. Obamacare helps the poor by giving them essentially free health care via Medicaid, and it helps older people because it limits how much more they can be charged for health plans compared to younger people. In effect, under Obamacare, younger people’s premiums help subsidize coverage for older people, who tend to consume more medical services. If you are young, have a high income, or both, the Republican bill could allow you to buy cheaper insurance. It allows insurers to charge younger people just 20 percent of what they charge older customers and provides tax credits to some middle-class Americans who don’t get much financial help through Obamacare. It’s hard to think of a policy more associated with Obama and today’s Democratic Party than the Affordable Care Act. This is not meant to be an exhaustive list of reasons why Republicans want to repeal Obamacare. For example, one reason we didn’t touch on was that although the GOP is casting this bill as about health care, some experts argue it’s really a stealthy way to cut taxes for the wealthy. (The legislation includes more than $600 billion in tax cuts, including rolling back both payroll and investment tax increases for people who make more than $200,000 a year.) This analysis is also not meant to suggest that these are good reasons, or even politically advantageous ones. Nor does it mean that health care reform will necessarily be adopted by Congress. Reasons 1 and 4 provide an argument that Republicans should adopt something that they can credibly tell conservative voters is a repeal of Obamacare — allowing them to keep their promises and annoy liberals by rolling back one of Obama’s major accomplishments — but that still leaves much of the law in place, thereby appealing to the majority of voters who don’t like the AHCA. But if the GOP took that route, the conservative activists and purists discussed in sections 2 and 3 might revolt, as they want to repeal as much of Obamacare as possible. Those competing incentives that are making life difficult for the party at large are reflected more narrowly in what is happening right now in Washington, where Senate Republicans are trying to write a bill that will get 50 of the chamber’s 52 party members behind it. There is a divide between more moderate Republicans, like Alaska’s Lisa Murkowski, who want to leave some of the Medicaid expansion in place, versus those like Utah’s Mike Lee, who favor a more comprehensive repeal of Obamacare. That kind of conservative-moderate divide is common on many bills, but on health care, there is also a divide between people like Lee and those like Trump and Senate Majority Leader Mitch McConnell. It’s not clear that Trump or McConnell have clearly defined views on health care. So getting a bill through — but not a “mean” bill — would both accomplish a key party goal and potentially minimize the political fallout. In contrast, Lee has very specific health policy goals. And he may prefer no bill at all to one that he feels does not repeal enough of Obamacare. People who say they voted for Trump but weren’t excited about doing so.